So says Tina Søgaard, owner and founder of e-cooking skincare. We all know in our heart of hearts that however much product we put on our skin we have to start with some basic principles. As well as allowing an inner calm if at all possible there are, we know, a few simple rules to start with before we put any products on our skin. Good diet, eat badly and you will have bad skin it really is that simple… you binge and you know it WILL show up in your face, whether it be in the form of pimples or just a greyer than desired complexion. Hydrate, don’t over do it, but water is key to glowing firm skin, it doesn’t matter what type of skin you have, hydration in the way of water is possibly the best thing you can do for your skin. A healthy happy lifestyle, we know that when bad things happen it shows on our face, even the best poker face can’t hide distress, hurt, and pain; yet a happy person usually glows, think of a bride on her wedding day. However, what happens to our skin when stress REALLY hits? Our skin is after all one of the best mirrors to how we feel emotionally and physically. How much is our skin affected by what is going on in our mind? Our soul? Our creativity? What we ultimately need to harness from within in order to inwardly heal so that we outwardly glow? It was after a truly awful personal crisis that Tina saw how her skin was affected. Suddenly she says her skin became more ‘tired’ and ‘grey’ than ever before. Because she had also lost a lot of weight in a very short space of time, her skin completely collapsed. So what does any woman do, cry into her handbag? Not this lady, she sat down at her kitchen table and created the skin care she knows she needed. She had experience in the beauty industry working within the arena of skin care and so she knew where to start. She started in her kitchen, buying raw ingredients and started to mix creams, serums, and oils on her table; every other day, mixing a new fresh batch, to keep in the fridge. Very quickly she saw the visible results on her skin. So palpable was the difference of her home-mixed product that they quickly became popular with family and friends. But it was not until someone asked for a small bulk buy that she thought she maybe had a business opportunity. In fact, she actually started her working life wanting to be a perfume nose (she naturally has an AMAZINGLY ACCURATE sense of smell) but ended up a graphic designer. But it is like the moment in life where if we are tuned to our inner selves our life experiences start to come together. If we really do follow our gut and listen, the universe will take us ultimately where we need to be. Even if the journey there knocks us sideways. In the end, it is our inner voice, our creativity, our soul that leads us toward our true selves and to what will save us and also, if we are lucky, help others along the way. Initially for Tina it was about having ‘problem-solving’ products, ones she knew she needed for herself, and that showed such great results so quickly, with massive feedback and requests for them from family and friends, so her next step was helping others with their skin issues and she has said this was “sheer therapy” for her and her need to ‘help’ people was brought alive within her… maybe that is part of using her inner creativity help her save herself? There is nothing like helping others in order to help yourself… and so starts the story of e-Cooking. 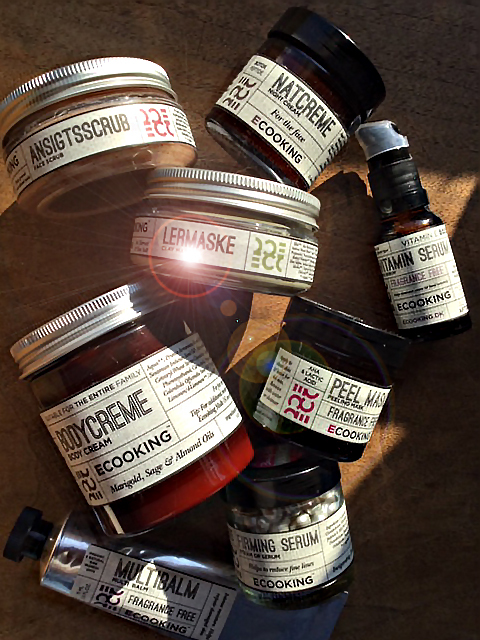 E-cooking is now a complete Danish skincare range that is rich on organic and natural ingredients and does not compromise on efficiency. E-cooking is based on honesty and transparency, which is why all labels, perfectly designed with Tina graphic design background, show precisely what the products contain. The range now covers everything from body wash to lip creams, serums to gentle exfoliants night and day creams and even and dishwashing cream. It’s very reasonably priced as Tina believes all should have access to great skin care. An affordable luxury range that has not just sustained and rebuild one woman’s life, but many men, women’s and children too. Great lady to celebrate International Women’s Day.